We gave him the opportunity to create his own project and experience two very different roles this week, working alongside both the Marketing and Factory Teams. Click the button below to read his excellent blog and find out more about how he got on. 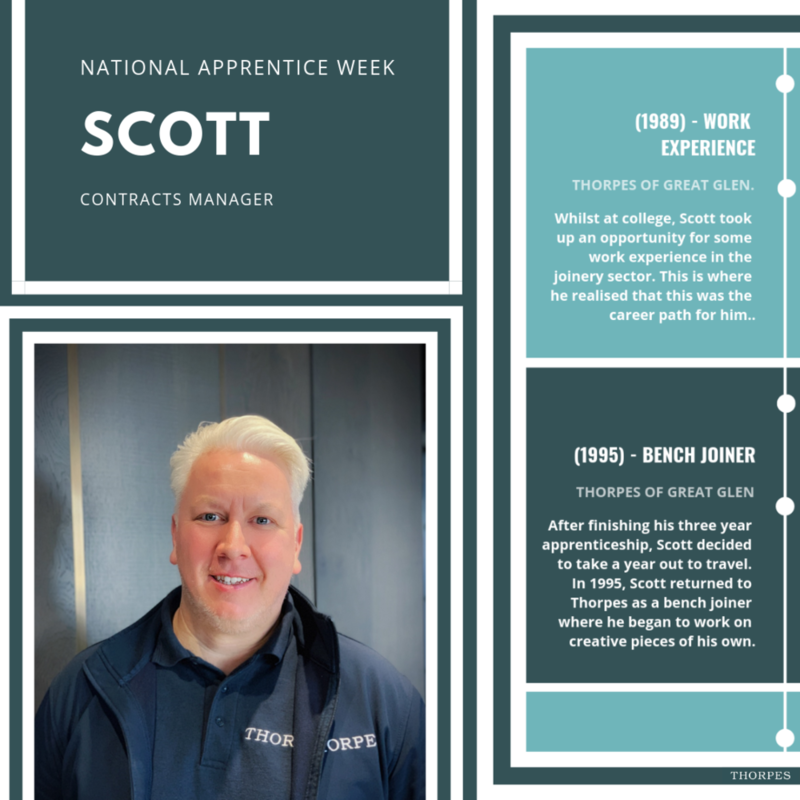 We are proud of all of our Apprentices both past and present, and so we are delighted to celebrate National Apprentice Week 2019 here at Thorpes. Click the link below to find out the career pathways of two of our previous apprentices. Our move into our new and improved home in September 2017 has been a success. Manufacturing space increased by 60% and alongside that our office space grew too, but all those new desks were not made to lay there empty. Click the link below to find out more about our three new team members and what they bring to Thorpes. Clink the link below to find out what we did. We are delighted that following an audit by monitors from the Considerate Constructors Scheme, Thorpes Joinery have been awarded a 4 Star rating! Click the link to find out more about how this scheme is improving the image of construction, and what it means for us. 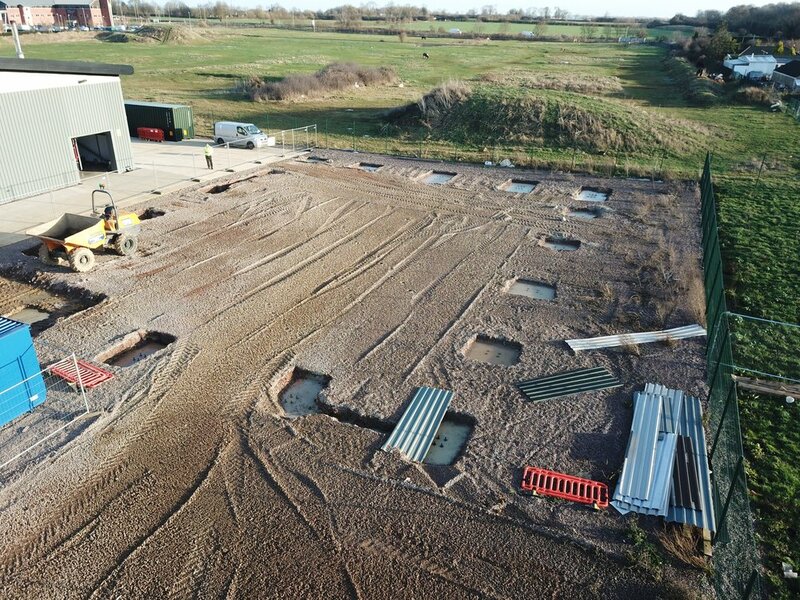 We are delighted to announce that construction has begun for our new Delivery & Distribution Centre. Click the link below for details about our latest expansion and what this means for our service. To mark our first year working at our new HQ in Market Harborough, we’re bringing our ‘Year in Review’ a few months early to highlight a triumphant year for all at Thorpes. Following our new case study for Willis Towers Watson, we take a closer look at how the reception desk for this project became a reality; with manufacture taking place during our move to Market Harborough! Click below to learn more. Kristal's interest in working for Thorpes stemmed from our company values: "Thorpes are a company that cares, and that's so important for the health and safety of employees"
Click below to learn more about our new H&S manager! Over the past few weeks we've had the pleasure of working alongside work experience students from local colleges. Click below to see what they got up during their first week in the working world! We are thrilled to have worked along side The Stephen Lawrence Charitable Trust to help redesign their co-working environment. Click below to read more about the Trust and our project input! Continuing behind the scenes tour of our new factory, we now look at our new Spray Shop as another great improvement to our production capabilities following our move to Market Harborough. Click below to see for yourself! Leicestershire County Cricket Club formally announced the renewal of our sponsorship deal with the first-class side. Click below to read more about our support for the team! Click below to read more about our new factory floor! As part of our "Behind the Scenes" series, we're highlighting the changes between our manufacture space in Great Glen to current production in Market Harborough! A recent change in our company structure has officially come into action this week. Take a look at who's involved and how this suits Thorpes' relocation to Market Harborough. Take a look over our company history with apprenticeships while we celebrate the success of our current and qualified apprentices here at Thorpes for #NAW2018! One week on from our official opening event, we've document the days activities, photos, and social media highlights to show the day's success! As 2018 gets into full swing we take a look back at some of the facts and figures that made 2017 such a momentous year in our company's history. Hosted for the first time in our new home in Market Harborough, the Christmas raffle was once again a resounding success in raising a terrific amount for a local charity. Members of the Thorpes team get into the Christmas Spirit for charity. We are delighted to announce that our new custom built manufacturing facility is officially under our ownership and that the move in process can now begin.